Welcome! The lobby of the Deranged L.A. Crimes theater is open — a day late. It took us a while to to scrape gum off of the floor and throw away the old popcorn boxes and soda cups. Find a seat and get comfortable. 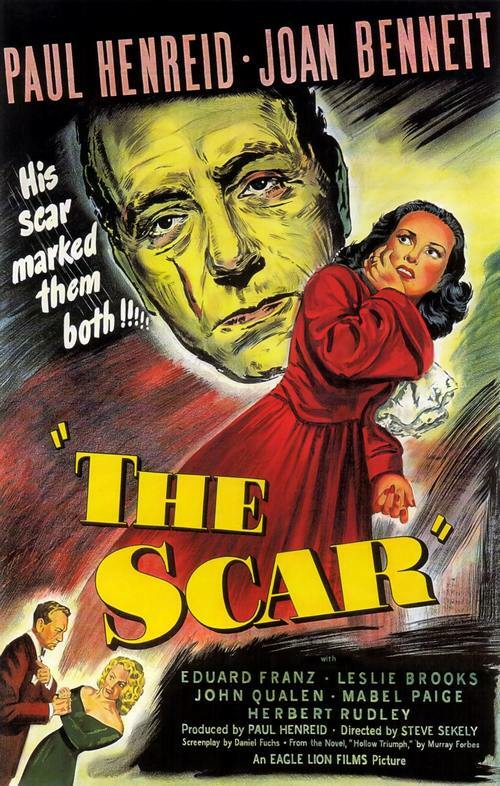 Tonight’s offering is THE SCAR starring Paul Henreid and Joan Bennett. After serving a jail sentence, gangster John Muller is offered a job by his parole officer at the Meiklejohn company in Los Angeles. Before he settles down, John is anxious to perform one more heist, and convinces his former gang to help him rob a gambling house owned by rival mobster Rocky Stansyck. While escaping with the cash, gang members Big Boy and Rosie are caught by Stansyck, but John and his friend Marcy escape. Marcy, who is terrified that Stansyck’s men will hunt him down and kill him, moves to Mexico, while John accepts the job at Meiklejohn. Later John’s brother Frederick tells him that Marcy was murdered in Mexico City and that Stansyck’s men have tracked John to Los Angeles. One day while running an office errand, John is mistaken for a psychologist named Victor Bartok, who, except for a scar on his face, could easily pass as John’s double. I sense a twisted plan of stolen identity! The holidays are not a joy for everyone. Family gatherings and booze can be a volatile, and sometimes deadly, mix. Petty grievances which have festered for months occasionally erupt into violence; but whether it is a long-standing feud, a dispute over who is in charge of the remote, or an argument over who can claim the last slice of pumpkin pie, holiday homicides are often the result of too many cocktails and too much togetherness. In the case of the Thorpes the catalyst for violence wasn’t a piece of pie or a drumstick, it was the visit by a former spouse that caused a fatal argument. 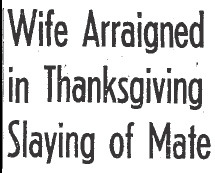 On November 27, 1952, Thanksgiving evening, Seal Beach cops received a telephone call from forty-one year old Frances Conant Thorpe. She said that she and her husband, fifty-two year old Garden Grove businessman Herman T. Thorpe, had spent the day drinking and arguing and she had shot him as they wrestled for possession of a revolver. According to Frances the argument started after her ex-husband, Al McNutt, had dropped by to extend Thanksgiving greetings to the newlywed couple — the Thorpes had been married just eight months. When questioned by investigators Frances offered serveral different versions of the shooting. She told Officer William Dowdy of the Seal Beach Police Department that Herman had committed suicide, she told Deputy Coroner Walter Fox that she shot Herman twice during a scuffle. Finally she told District Attorney Investigator M.D. Williams that Herman had tried to shoot her and she fell, striking her head on a box, and when she revived several hours later Herman was dead on the bedroom floor. Herman’s autopsy revealed nothing to suggest that the bullet wounds to his chest and left forearm were self-inflicted. 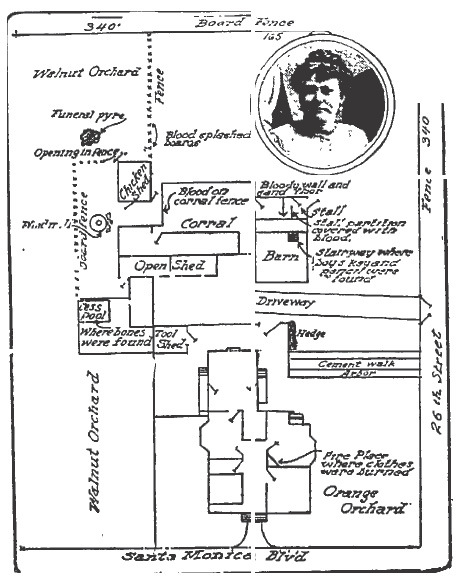 Investigators determined that the position of the weapon found under Herman’s body and the trajectory of the fatal round made it virtually impossible for his death to have been a suicide.There wasn’t a speck of gunshot residue on the dead man’s hands, nor were there any powder burns on his chest or arm. However there were traces of gun powder on Frances’ bathrobe and on her left hand. 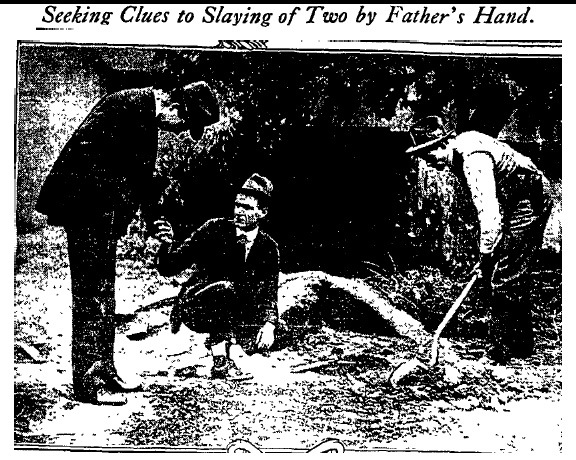 Frances was held to answer for the slaying. The jury deliberated for six hours and twenty-eight minutes before finding Frances Thorpe guilty of manslaughter. The Los Angeles Times did not report on Frances’ sentencing hearing. NOTE: On this Thanksgiving I ask you to remember, you only have to cope with that particularly annoying relative once a year so leave the gun at home. Best wishes for a safe holiday! Welcome! The lobby of the Deranged L.A. Crimes theater is open! Grab a bucket of popcorn, some Milk Duds and a Coke and find a seat. 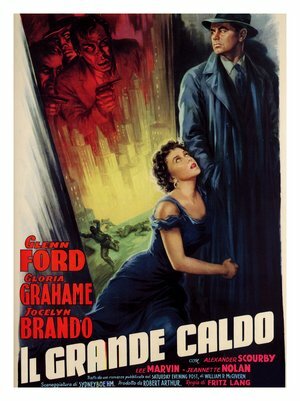 Tonight’s feature is THE BIG HEAT, directed by Fritz Lang and starring Gloria Grahame and Glenn Ford. Enjoy the film! After the suicide of detective Sgt. Tom Duncan, his wife Bertha takes his detailed notes on racketeer Mike Lagana’s organization, then demands money and protection from the mob boss to keep the notes secret. Lagana places the Duncan situation with his right-hand man, Vince Stone. Homicide detective Sgt. Dave Bannion is assigned to investigate Duncan’s death and upon questioning a bereft Bertha, finds her explanation that Duncan suffered a mysterious malady suspicious. Later at home with his wife Katie and young daughter Joyce, Dave reads that the police department has accepted Bertha’s assertions without question. That evening Lucy Chapman, a fading B-girl, contacts Dave and they meet at The Retreat bar where Lucy debunks Bertha’s story, claiming that she and Duncan dated and that Bertha had just agreed to give her husband a divorce. When Dave cautions Lucy not to attempt to blackmail Bertha, Lucy angrily threatens to take her information to the newspapers. Dave then visits Bertha, who dismisses the divorce story, despite her knowledge of Duncan’s relationship with Lucy. The next day at headquarters, Dave learns of the discovery of an unidentified woman who had been thrown from a car after being beaten and tortured. 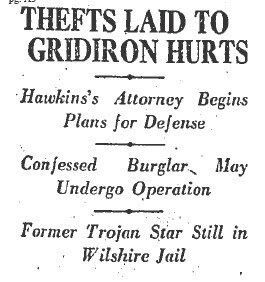 Former USC football idol, Johnny Hawkins, was arrested for burglary in the home of Biltmore orchestra leader, Earl Burnett. He was found in the living room holding a flashlight and listening to the radio. Hawkins immediately confessed to more than two dozen residential burglaries over the period of a few months, and he told the police that he had committed the crimes because he desperate for money in part because his wife had major medical bills. Hawkins was about the last guy that anyone would have expected to turn to crime. He had been the captain and quarterback of the USC football team, in fact he was an all around fine athlete playing football, baseball and basketball with equal skill. He could have had a career in any of the sports in which he excelled, but the first couple of years following his graduation from college had proved difficult for Johnny. Cops were baffled when Johnny led them to the attic of his parent’s Fullerton home and showed them his ill-gotten loot because he had made no attempt to sell any of the items. If he was in serious need of money why would he have kept the loot? Another odd wrinkle in the case came when it was discovered that about a week before Johnny’s arrest one of his younger brothers, Jimmy, had been taken into custody for grand theft. In early June 1928, just days prior to Johnny’s arrest, Jimmy Hawkins had stopped in at the home of Mrs. Betty Sheridan on Normandie Avenue. While Betty was on the telephone with her sister Jimmy disappeared, taking with him $1500 worth of her jewelry. It isn’t clear how Jimmy became acquainted with Betty — she said she knew his father was a prominent citizen in Fullerton but didn’t seem to know anything else about the young man or his background. Jimmy was taken into custody by the LAPD, and while he was cooling his heels in a jail cell he got a visitor — his older brother Johnny. Johnny delivered a severe lecture to his sibling and convinced the younger man to return the stolen jewelry. The D.A. declined to press charges and Jimmy was released. Unfortunately, Johnny’s encounter with the law didn’t go nearly as well as his brother’s had and he was charged with thirty-one counts of burglary. If Johnny thought his life couldn’t get any worse he was wrong. His brother Jimmy was arrested again — but this time it was as an accomplice. The L.A. Times likened Johnny to Fagin, the receiver of stolen goods and leader of a group of thieving children in the Charles Dickens novel “Oliver Twist”. Not a flattering comparison, and it demonstrated how far Johnny had fallen, at least in the eyes of the press. Jimmy didn’t hold up well under interrogation and he confessed, but he shifted the bulk of the blame onto his older brother. He told cops that when he became unwilling to continue the residential crime spree, Johnny became domineering and forced him to continue the illicit activities. Johnny hired an attorney, Joe Ryan, who appeared to believe in his client. Hawkins had confided in Ryan that he was stealing because he was seized by an uncontrollable mania, which he believed had been caused by an injury to his head while playing football. He had a lump over his left eye that may have been the outward sign of severe brain trauma. In August 1928, Johnny Hawkins appeared in Superior Court to plead guilty to five out of thirty-one counts of burglary and to file an application for probation so that he might avoid a prison term. Hawkins’ attorney, Joe Ryan, told the court that his client was under the care of Dr. Cecil Reynolds, a brain specialist, who intended to perform brain surgery to relieve pressure believed to have been caused by a football injury — an injury on which Johnny blamed his recent criminal tendencies. While awaiting a probation hearing Johnny fainted and fell to the concrete floor of the attorney’s room in the jail and received another serious skull injury. 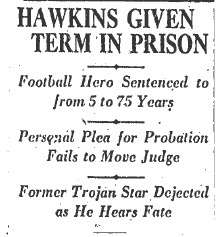 Despite the compelling argument that his repeated head injuries had caused Hawkins to pursue a brief life of crime there was no recommendation for probation, and Superior Judge Fricke sentenced the former college gridiron great to from five to seventy-five years in prison! After the pronouncement of sentence, Johnny shook hands with his counsel, who was also a friend of his from his glory days at USC, then bowed his head and walked from the courtroom manacled to a deputy sheriff. Nothing ever came of the brain operation that Johnny had hoped for. Hawkins served twenty-nine months in San Quentin before he was paroled. For seven years following his release he held a position in M.G.M’s art department; he even coached the studio basketball team to championships. On May 22, 1939, thirty-seven year old Johnny Hawkins died of an apparent brain abscess. Dr. Louis Gogol, assistant county autopsy surgeon, stated that in his opinion the injury Johnny had received while playing football at USC was the probable reason for the string of burglaries that he’d committed eleven years earlier. He went on to say that the previous injury was definitely the cause of his premature death. It is profoundly sad that only death could vindicate Johnny Hawkins, but shockingly things haven’t changed much in 85 years. Other than repeated brain trauma, the risk factors for chronic traumatic encephalopathy (CTE) remain unknown. The disease can only be definitively diagnosed postmortem. Johnny Hawkins had the kind of college sports career that one can only dream of; he was a gridiron hero who was equally skilled at basketball and baseball. 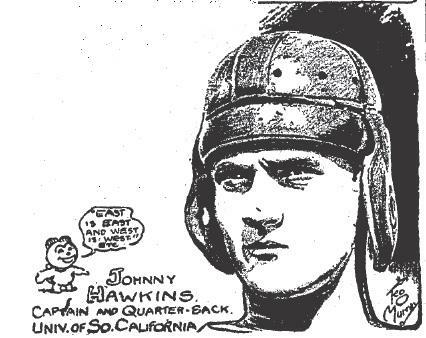 During the 1924 season Hawkins was quarterback and captain of USC’s football team and in 1925, prior to his graduation, he was awarded the Tesche-Davis medal for being an inspiration to his teammates. Despite his sports successes Hawkins seems to have found the transition from Big Man on Campus to Joe Everyman a difficult one because following his graduation from USC he bounced from job to job. 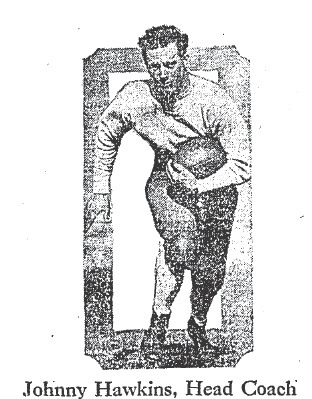 By 1926 Johnny appeared to be settling into a career; he had signed on as head coach for a South Pasadena military school, the Oneonta Academy. Oneonta was thrilled to have Hawkins on their coaching staff and took out a half page ad in the L.A. Times to announce his hiring. But Hawkins’ career took a downturn that same year after he organized and played with the Hollywood Generals, a Pacific Coast Football League team that failed fairly quickly. 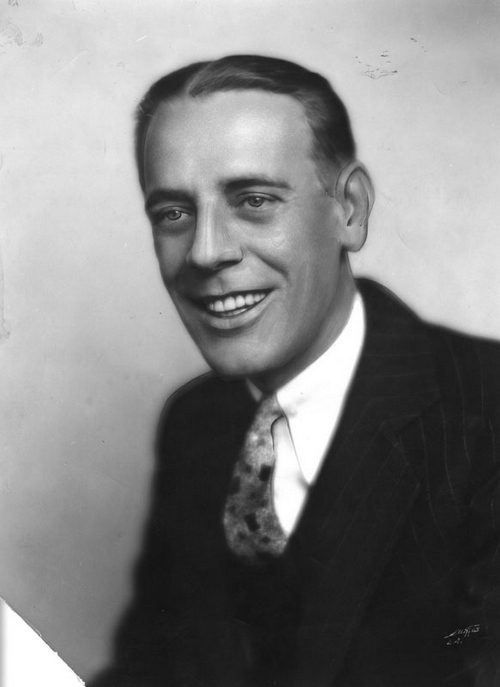 The death knell for Johnny’s post-college dreams of success came on an evening in mid-June 1928 when he was busted in the home of Earl Burtnett, leader of the Biltmore orchestra. Clarence Thomas, a houseboy at the Burtnett home on South Catalina Street, had seen a man entering the rear door of the house and had immediately called the law. LAPD Detective Lieutenants Steed, Green and Mole of Wilshire Division answered the call and found Hawkins sitting in the living room listening to the radio! 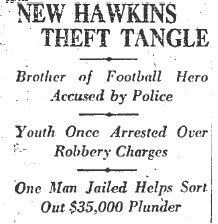 Hawkins wasn’t a hardened criminal and he promptly confessed to dozens of burglaries. He told his interrogators that he desperately needed to raise money because his recent career as a real estate salesman had gone to pieces and his wife, Thelma (his college sweetheart), was in serious need of major surgery. Johnny had been living with his parents in their Fullerton home while his wife was in Vancouver, Washington for her medical problems. He said that he had waited night after night until his parents were in bed before going out to commit the burglaries, then returning home to stash the loot in their attic. Police valued the recovered property at more than $35,000 ($479,252.34 current U.S. dollars), but seemed somewhat surprised that Hawkins had stolen such a hodgepodge of high and low dollar items including: furs, old silverware, gowns, blankets, percolators, typewriters, lingerie and jewelry. According to Johnny he never carried a weapon, a fact borne out by the arresting officers. When he was found in the Burtnett home he had in his possession a flashlight, jimmy, ice pick, pass keys and he was wearing white gloves. It was strange enough that the football idol had perpetrated a series of at least 25 residential burglaries, but it was stranger still that he’d never attempted to dispose of any of the loot. He’d supposedly been committing the thefts for a few months but all of the items, with the exception of a suitcase filled with “presents” for his wife, were accounted for. If he was as hard up for cash as he’d said then surely he could have borrowed money from his folks or his in-laws. Perhaps the former gridiron star had been too proud to borrow from family, but being busted for burglary and having his name splashed all over the local newspapers must have been even more humiliating. What was going on with Hawkins? Why would he jeopardize his freedom and his reputation in such a stupid way? NEXT TIME: A unique defense strategy. Welcome! The lobby of the Deranged L.A. Crimes theater is open! Grab a bucket of popcorn, some Milk Duds and a Coke and find a seat. Tonight’s feature is HIS KIND OF WOMAN, directed by John Farrow and starring Jane Russell, Robert Mitchum, Vincent Price and Tim Holt. Enjoy the film! Gangster Nick Ferraro, who has been living in Naples since his deportation from the United States, is anxious to return to the States to put his lucrative enterprises in order. To accomplish this, he and his cohorts in the States and Mexico–Corle, Thompson and Martin Krafft–select an unwitting gambler named Dan Milner, whose weight and height match Ferraro’s, to provide Ferraro with a new identity. Corle offers Dan $50,000 to go to Mexico for a year, without revealing who is paying him or why. Broke, Dan accepts the initial $20,000 payment and travels to Nogales, Mexico, to receive further instructions. While waiting for a plane to take him to his final destination, Dan meets Lenore Brent, a beautiful heiress and polished singer. Benton Barrett had confessed to the murders of his wife Irene and his stepson Raymond, but was he guilty? His confession had lacked crucial details and he appeared to have been so highly suggestible during his interrogation by the Santa Monica police that he was willing to admit to anything they tried to pin on him. Benton’s courtroom demeanor reflected his inability to appreciate his predicament. He was at times befuddled and could be heard chuckling for no apparent reason, and at other times he chanted psalms or nodded off. 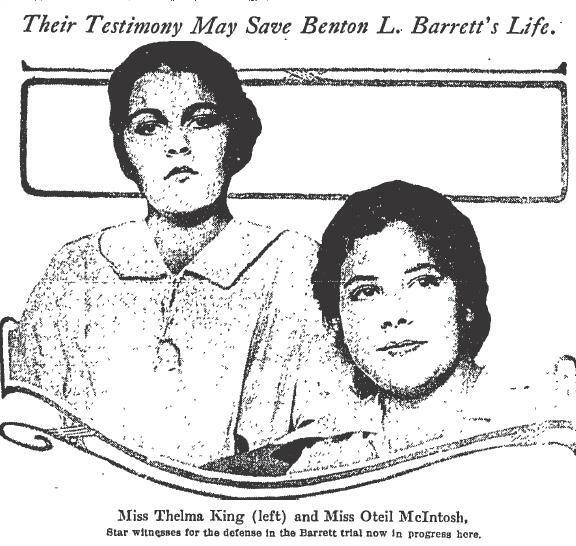 It was fortunate for Barrett that his attorney had found two girls, Oteil McIntosh and Thelma King, who could testify to having seen the alleged murder victims alive and well long after their bones were supposed to have been pitched into a cesspool by Benton. On the witness stand Oteil told a packed courtroom how she had seen Raymond Wright driving a woman fitting the description of Irene Barrett in an automobile. She had shouted a greeting to the boy: “Hello, Ray”, and he’d answered: “Hello, Oteil. Then he had reached forward to shift the car into gear and speed away. Oteil was acquainted with Raymond because they attended school together and he’d even come to her home and played football with her brothers! Thelma took the stand and corroborated Oteil’s testimony. She said that the two of them had been out walking and the encounter with Raymond happened exactly as Oteil had testified. When asked what she had said after the car had passed, Thelma said that she had remarked that Raymond wasn’t a very handsome boy and Oteil had agreed — then they shared a laugh. 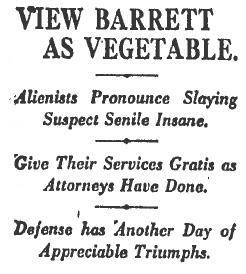 The defense had struck gold with the girls and then did equally well with three unpaid alienists who declared Barrett to be a complete lunatic. The accused was described as a “…man-vegetable, a hopeless victim of senile dementia, human only in frame, still in touch with human kind by occasionally reaching islands of sanity in his mental realm.” A very bleak picture to be sure. 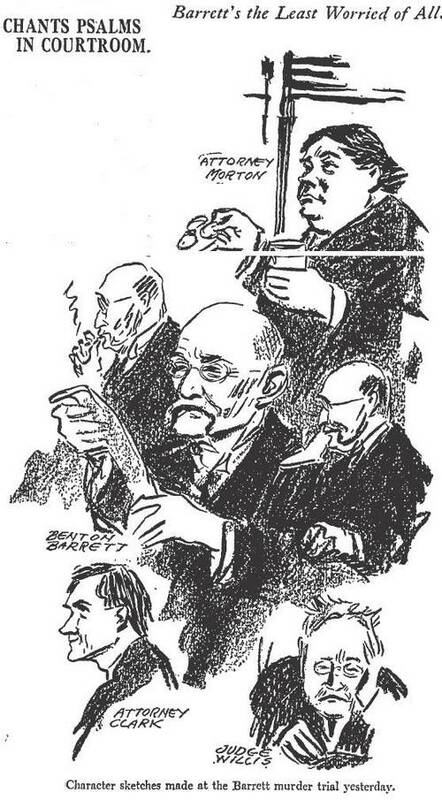 Dr. Hay Rochester offered his opinion that despite the worries and stress of a murder trial, Barrett had managed to gain quite a bit of weight which he stated was clear evidence of the man’s insanity! Another of the shrinks described Barrett as a “week, susceptible, mentally depraved old man” and went on to say that Barrett was unquestionably insane, and could easily have been convinced that he had murdered his wife and stepson. Of course the only opinions that mattered were those of the twelve citizens in the jury box. They deliberated for hours and it appeared that they would not be able to reach a verdict. They requested clarification on a few points of law then retreated behind closed doors. It took them close to thirty and one-half hours before they concluded that Benton Barrett was not guilty by reason of insanity. In March 1927 a local newspaper reported that Delia B. Rawson, a long time friend of Irene Barrett’s, had recently received a letter postmarked in Canada supposedly written by the dead woman! If Irene and Raymond were alive, and it certainly appeared that they were, some important questions would likely go unanswered forever. What did Irene gain by running off? Perhaps the most vexing question was whose bones were found in the cesspool? I believe that describes us all. Facing a bucketful of bones (left to right): Chief of Police F.W. Ferguson of Santa Monica; Benton L. Barrett; Assistant Chief of Police Sidney Holt, Santa Monica; Capt. J.D. Hunter of D.A.’s office, and Lt. Clarence Webb, Santa Monica police. 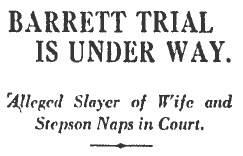 In custody for the murders of his wife Irene and his stepson Raymond, Benton Barrett told the cops that only way he could banish the mental picture of the crime was to stare at a photo of his wife — the small likeness of her he kept in his watch case. Barrett’s defense attorney, Lewis D. Collings, and Capt. H.L. Zimmer, an investigator, didn’t believe the man’s confession for one minute. According to Collings and Zimmer there were several people, principally his wife Irene, who had schemed to pray on Barrett’s weakened mind for the sole purpose of profit. Allegedly the conspirators expected Benton either to be sent to the gallows or to end his own life. Collings offered facts to support his belief in Benton’s innocence. 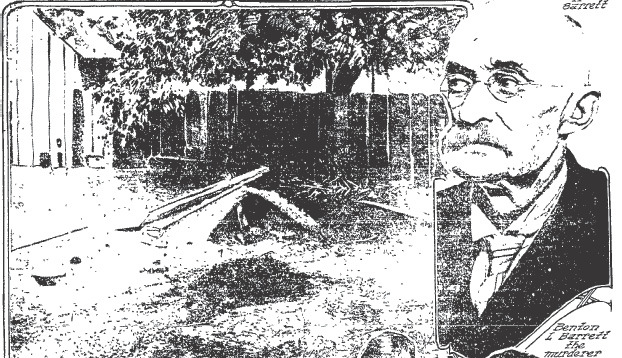 Collings said that Barrett had been senile for months and was about to have a guardian appointed — which would have conveniently gotten him out of the way; Barrett confessed to the murder but was so weak-minded that he changed his story each time the detectives suggested another possibility; and the fire in which Barrett said he’d burned the bodies wasn’t long enough to contain his wife’s body. Barrett’s attorney went on to say that the bones found in the outhouse had not been there on the Saturday following the fire, yet in his confession Benton had stated he’d put the bones in cesspool on Friday! Additionally, the bones in the outhouse were bleached by the sun; the marrow remained intact and had not been not melted away as it should have been if subjected to heat, and the bones were also free of flesh. A case as bizarre and highly publicized as Barrett’s attracts every nutcase for miles. Among the assorted wackos was a dowser using one of Irene’s gloves and one of Raymond’s shirts wrapped around his dowsing wand — he was seeking their remains and not the perfect place to drill for water. The man went to the barn where the murders were believed to have occurred, then he went out to Topanga Canyon and somehow convinced a detective to dig an acre of land to expose the bodies of Irene and Richard — nothing was found. In a letter to the editor Mr. W.D. 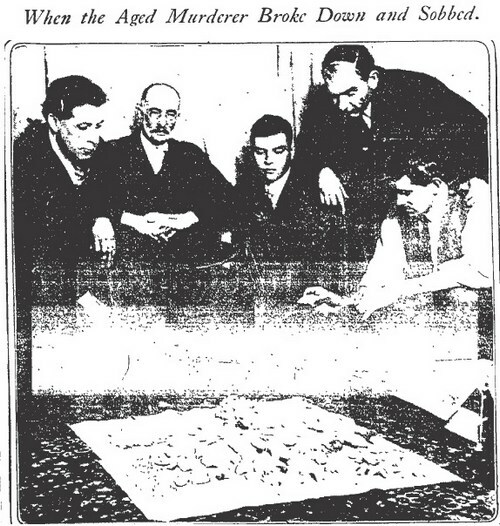 Turner of Long Beach offered an analysis of the case. He believed that the murders were committed, but that Barrett had help in disposing of the bodies. He went on at length to describe how bones can reveal to whom they belonged in life. Disturbing reports that Irene had been planning to disappear and take some of Benton’s money with her began to surface. Two days prior to her disappearance Irene had purchased new clothes for herself and her son — she’d also bought a suitcase. Barrett’s attorney announced that there would be a $1000 reward for information leading to the whereabouts of Irene and Raymond. Witnesses came forward and stated that they’d seen the supposed murder victims in San Diego, but investigators couldn’t locate the mother and son if, in fact, they were still alive. Barrett’s original attorneys withdrew from the case claiming that they were not being provided with a sufficient number of investigators and experts to mount a vigorous defense. In all seven attorneys would join, then depart, the defense team. 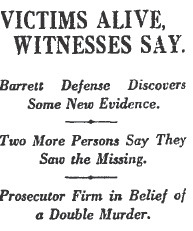 By April 1917 only one attorney remained, Ona W. Morton. During jury selection Barrett chanted hymns and kept a meticulous account of the number of glasses of water he consumed — 70 in one day. Barrett’s trial drew a SRO crowd every day. Defense attorney Morton argued that there was no evidence that Irene Barrett or her son Raymond Wright were dead, let alone murdered, and the jury must acquit his client. Would the jury agree with Morton? 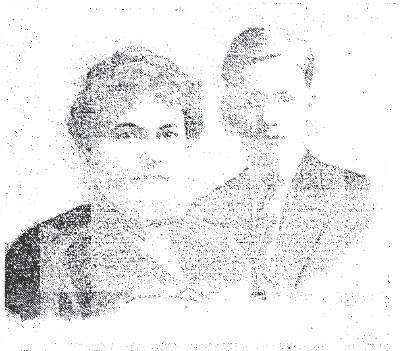 Benton L. Barrett (65) hadn’t known Irene (45) for very long before he married her in San Diego in 1914. Irene had been keen on a brief courtship and Benton happily demurred — after all, he was in love. Irene didn’t want to rush to the altar because she was crazy in love with Benton — far from it. She was working a badger game on him. Benton had signed over a one-half interest in his 5 acre property, plus $25,000 ($584,000 in current dollars), to Irene before they ever strolled down the aisle! Irene wasn’t the only person with a vested interest in Benton’s money and property. While still a newlywed Irene claimed that Benton’s cousin, Charles (an attorney), had it in for her and was spreading rumors about her extra-marital affairs. Unfortunately for Irene, they weren’t rumors. Charles had hired a private investigator to shadow Irene and the PI uncovered evidence of Irene’s infidelity. Was Benton’s jealousy enough to drive him to commit murder? On October 18th Irene and her 17 year old son Raymond Wright suddenly vanished. Benton told the lawyer that he had obsessively tended the fire, then on Friday night he removed the skulls and long bones and threw them in the cesspool. Just like Lady Macbeth he compulsively washed his hands, but of course they wouldn’t come clean. Benton claimed self-defense and said that he had been driven to murder due to the various legal battles going on in the family. He said after he’d burned the bodies he had lapsed into a three day daze. Cops went to the property and found a small amount of burned bones and teeth in a backyard funeral pyre. Then they began to eyeball the cesspool under the outhouse — maybe it held a clue to the alleged murders. Hundreds of people circled the property and watched as police pulled several bloodied weapons from a barn. But Benton’s confession had developed some major holes. Many believed that the 65 year old man wasn’t capable of doing all of the heavy lifting involved in the killings without help – and there wasn’t a hint of an accomplice. Besides, there weren’t enough bones found to have made two complete adult skeletons. It was also troubling was that Benton seemed to be highly suggestible and changed his story based on what police would show him and tell him. Then there were the supposed sightings of Irene and Raymond which had begun within hours of their alleged murders! Unfortunately for Benton, neither his mental state, nor the sightings of his “victims”, would be enough to keep him from being tried for a double homicide. NEXT TIME: The tale of the Santa Monica Cesspool Slayings continues. Welcome! The lobby of the Deranged L.A. Crimes theater is open! Grab a bucket of popcorn, some Milk Duds and a Coke and find a seat. 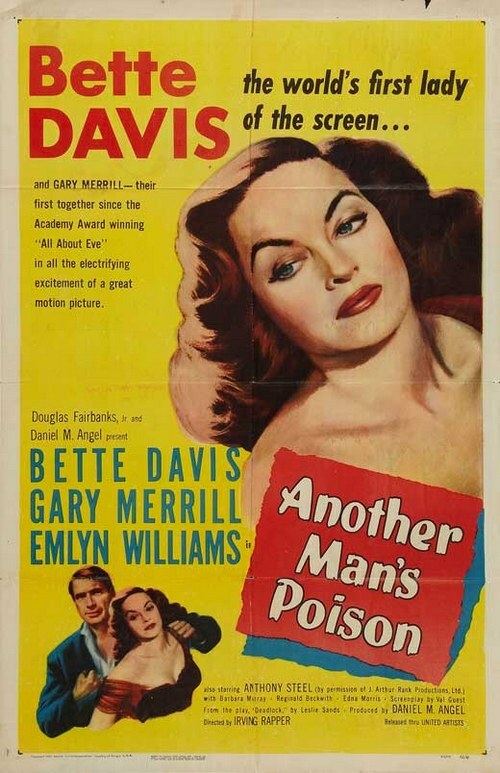 Tonight’s feature is ANOTHER MAN’S POISON starring Bette Davis and Gary Merrill. Mystery writer Janet Frobisher lives alone in a dark English country house, when she’s not philandering with her secretary’s fiancée. At an extremely awkward moment, she has an unwelcome visitor: George Bates, who claims to be the partner in crime of Janet’s estranged husband. George insinuates himself into Janet’s home and life despite her efforts to get rid of him; the tangled relationships develop into a macabre, murderous cat-and-mouse game.